This year Old South Vintage Rentals invited us to team up with them to create a designer room at the Southern Christmas Show in Charlotte, NC! We love working together — shaking things up in the city of Charlotte and Boone and everywhere in between! In the designer room, you'll find a big wreath made from magnolia and we wanted to share how to recreate that look for your next party! 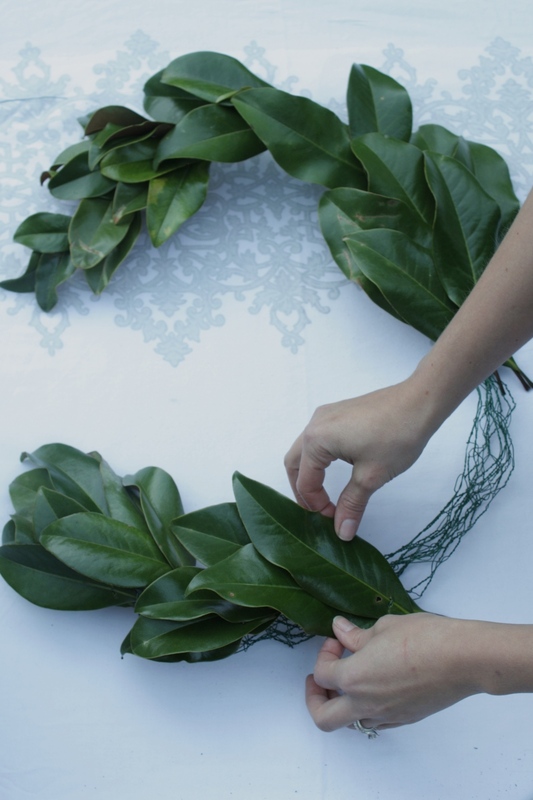 Start by taking the mesh wire and bend it into the shape you'd like your wreath to be. Then cut several 5 inch pieces of paddle wire. Gather three similar sized magnolia leaves, overlapping the main vein in each and place your thumb over the intersection. Take a piece of paddle wire, fold it into a u-shape and press an end through each side of the intersection. Take the group of wired leaves and attach them to the mesh wire shape. 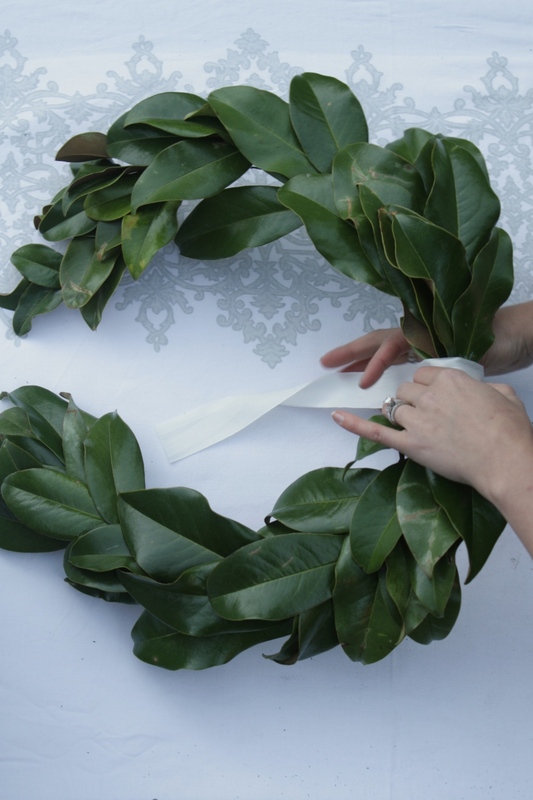 For this wreath, we used small leaves at the top and gradually used larger leaves as we worked towards the bottom. Wrap ribbon around the point where the leaves meet. Before securing the loose end on the backside of the wreath, insert a piece of ribbon horizontally on the frontside. This will be used to make the bow. Then use a straight pin to secure the ribbon from behind. Flip over the wreath and tie a bow with the horizontal ribbon to complete the look! There are a thousand different ways to use these basic skills and materials! Wire netting can be formed into so many designs — monograms, topiaries, swags, squares, photo backdrops & focal walls. We hope this DIY inspires you to dream bigger for your next party! Maybe you aren't a DYI person, but you want a designer look for your next event — Give Samantha and I a call. Old South Vintage Rentals has a beautiful inventory of furniture and home accessories available for rent and I love to ice off the look with fragrant seasonal florals! Please direct holiday decor inquiries to Samantha at Samantha@oldsouthvintagerentals.com and Kelly at kelly@philosophyflowers.com.